See the 14 Houston events and attractions that caught the most attention on our site in 2014. The last year was packed with events, new and old, along with the introduction of new attractions and destinations – all vying for the interest and attendance of busy Houstonians. With the end of the year in close sight, we took a deep look at our most popular event and attraction stories from the last 365 days to determine which proved to be the most popular on our site. To come up with the list, we identified the 30 most popular stories on our website and scored them based on their popularity with our Facebook audience. 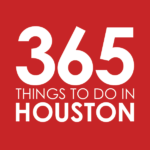 Round-ups of events and attractions, such as New Year’s Eve Parties, Valentine’s Day Date Ideas and our popular Houston Weekend Guides were not eligible. Therefore, we’re pleased to present our 14 most popular events and attractions in 2014, beginning with most popular story of the year. Blanket Bingo at Market Square Park – With the addition of themed nights for 2014, Market Square Park‘s Blanket Bingo found its fan base. Once a month, bingo players and social creatures of all ages braved the (typically) warm and humid evenings for a outdoor mingling, relaxation and a chance to shout “Bingo!” With themes including disco, Jimmy Buffett, Chrismas-in-July, bring-your-dog and others, it quickly became a must-do event and the surprise hit of the summer, selling out each month and extending to a bonus October edition. Lights in the Heights 2014 – Proving that it’s hard to keep a good thing secret, the Woodland Heights promotion-silenced public event still beckoned to its diehard fans. After we received request-after-request for information about this holiday stroll that rivaled Free Press Summer Fest in scope in 2012, we published the details and highlighted the neighborhood’s not-so-subtle effort to take back this public event. While the family-friendly component was maintained, crowd control remains a pressing issue for this holiday affair whose organizers are still striving to find a balance they can live with. Disney’s Frozen Sing-A-Long at Miller Outdoor Theatre – Houston families and Frozen fans of all ages couldn’t let an opportunity to belt the meme-inspiring songs of the Academy Award and Golden Globe-winning film pass them by. They jumped at the chance to spend the day after July 4 at the recently refurbished Miller Outdoor Theatre belting along with Elsa, Anna, Olaf, Kristof and Hans with songs about a snowman’s chance in summer, finishing each other’s sandwiches and letting it all go. Tamale Festival Houston in the East End – The siren call of fresh tamales accompanied by beer or margaritas proved overwhelming compelling to more than 200,000 of our fans and their friends on social media. Pre-empting the Mexican dish’s association with Christmas, the early December festival promised the opportunity to choose from a wide variety of vendors and flavors while mixing it up at an outdoor street festival in Houston’s increasingly popular East End. Houston Restaurant Weeks 2014 – August’s annual drive to fill Houston’s most popular restaurants, while raising significant coin to help the Houston Food Bank provide meals, was predictably popular. Further aiding the cause, the guide featured a lip-smacking photo of Michael Cordúa’s award-winning Churrasco steak from Américas and Churrascos. In addition to rounding up a complete list of participating restaurants, we also highlighted delicious HRW menu items from Nara Sushi + Korean Kitchen on Upper Kirby and Danton’s Gulf Coast Seafood Kitchen in the Museum District. Patrick Dougherty’s Stickwork Boogie Woogie at Hermann Park – The yearlong Art in the Park program at Hermann Park marked the park’s 100-year celebration and culminated in the debut of the stunning new McGovern Centennial Gardens. One of the program’s earliest art installations was Patrick Dougherty’s curious stickwork dwelling. With its oddly inviting open doorways and windows, the whimsically-named Boogie Woogie has welcomed thousands of Houstonians and Houston visitors of every age. It’s become a landmark along the Hermann Park Railroad, a bona fide tourist destination and a popular site for engagement photos. Fortunately the stickwork structure will be sticking around for a good while longer than 2014’s art program. Although natural elements will eventually degrade the work and it will be removed, park officials estimate that sad day is still several years away. Hot Undies Run in Rice Village – A cheeky event that looks and sounds more scandalous than it actually is, this fun run through and around Rice Village encouraged participants to run in their undies; but most chose a combination of bathing suits, speedos and white gym shorts. Still, the late June event promised a lot of skin, even if it was the same variety that you’d see at Houston’s public pools, the YMCA, Fit Athletic Club or the Houstonian. The temptation proved too compelling and readers couldn’t help but sneak an extra peek. 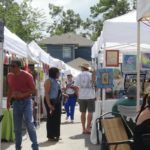 First Saturday Arts Market in the Heights –With a reliable format, welcoming location and monthly change in entertainment, the Heights’ popular art and vendor market proved a reliable favorite throughout the 2014. A shift to evening hours in the summer and tie-ins to the also popular White Linen Night and other seasonal events keeps the musical market fresh and relevant 12 months out of the year. Sunday Streets HTX Spring Pilot Program – Inspired by a concept that’s long been popular in other cities, Mayor Parker‘s office launched a trial for Sunday Streets HTX last Spring. On the first Sunday of the month, from April through June, a stretch of busy thoroughfare inside the Loop was closed to automobile traffic. However, pedestrians, runners, cyclists, skateboarders, dancers, roller bladers (and roller blade dancers) and more were encouraged to fill their space. The popularity prompted another installment in Fall 2014. More Sunday street closures are to be expected in the spring of 2015. 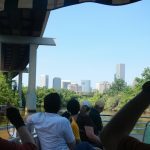 Waugh Bridge Bat Colony Pontoon Boat Tours – Proving that an attraction doesn’t have to be big to be compelling, Buffalo Bayou Partnership’s intimate 90-minute summer boat tour series routinely sold out, offering Houstonians a water-based view of the Waugh Bridge. Just before sunset on warm nights, the 250,000 Mexican freetail bats that live underneath bridge begin to take flight (and do their part to put a small dent in Houston’s summer mosquito and other insect population). Architects of Air’s Miracoco at Discovery Green – Over spring break, Houstonians were able to escape into British-based Architects of Air’s giant inflatable domes and hallways. Known as Miracoco, the colorfully pliant attraction spanned half the size of a football field, providing visitors with great photo ops and otherworldly explorations. The socks-only crowd-pleaser regularly filled up and ensured the continuation of Discovery Green‘s streak of winning attractions, experiences, installations and performances. Haute Wheels Food Truck Festival – Any larger-than-average gathering of food trucks is sure to start stomachs growling, but last spring’s Haute Wheels, held at HCC Southwest West Loop Campus, proved to be the year’s most popular online. Reasonable prices, the publicized music line-up, a nonprofit beneficiary and sunny spring weather likely helped this one rise to the top of the food truck frenzy. White Linen Night in the Heights – Submitted as further evidence that locals like to be swallowed into the Greater Heights for freeform events, White Linen Night continues to draw crowds. In the steamiest part of summer, the Heights is overrun with sweaty and thirsty (but spirited) Houstonians crisply dressed in white. Wandering down their favorite Heights streets and neighorhoods, they discover and enjoy private and public parties, food and drink specials, outdoor art markets, live music, pop-up shops and other good fun on a humid Houston night. War’hous Visual Studios’ 3rd Annual Star Wars Art Festival – Created to mark International Star Wars Day, May the 4th (be with you), artist and entrepreneur Dandee Warhol‘s art festival continued to bring sci-fi loving artists together to display and sell their Star Wars-inspired creations, while costumed patrons enjoy the ambience. For 2014, the event expanded to a new and bigger location, with all new family-friendly hours. Anticipation for Star Wars continues to increase, courtesy of the Thanksgiving weekend release of the first teaser trailer for JJ Abrams’ Star Wars: The Force Awakens. So the 2015 event is sure to be packed with all new goods, costumes and creations inspired by peeks at fantastic new characters, vehicles, tech and places.